No Pride in Genocide: LGBTQIA+ Solidarity with Black Power! 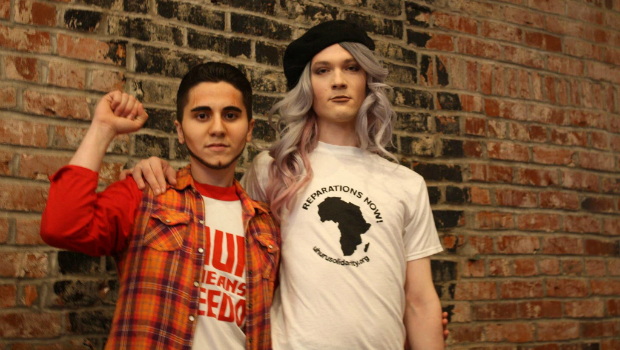 Comrades Joey Kadre and Sally Darity dragging imperialism to its grave! I am a white person of the LGBTQIA+ (lesbian, gay, bisexual, transgender, queer, intersex, asexual) population in solidarity with Black Power. Ever since I joined the Uhuru Solidarity Movement, working under the leadership of the African People's Socialist Party, I am no longer an “activist” for “gay rights”, but a solidarity force for the liberation of the African nation. I was living in Oklahoma and organized around carving out social space for LGBTQIA+ people in a town that didn’t always accept us. I attended a university and hid away in the women’s and gender studies department, writing papers theorizing oppression in the world. I then fled to Portland, Oregon where I knew I could feel safer as a queer person. I came across Secretary General Gazi Kodzo’s internet presence and found the Uhuru Solidarity Movement. I began to understand that gender and sexuality issues are caused by colonialism, but impact black and brown communities at genocidal rates. I also learned that the source of the oppression is the same system of parasitic capitalism, but that the system creates a different reality for the colonizer and the colonized. For example, I had the resources to move to Portland, OR from Oklahoma to feel comfortable as a white queer person, but no African person can feel comfortable anywhere they are in the world. No oppression can ever be solved completely until colonized people have complete power over their own lives and all resources and land returned. Salute to Chairman Omali Yeshitela for creating the theory to understand even my oppression as a white queer person, as well as the solution to overturn it! African Internationalism explains that before Europe assaulted Africa, Europeans were living under feudalism. There were such little resources, that the ruling class/nobility hoarded these resources and created private property to be passed down genetically and not shared with the people en masse. When Europe assaulted Africa, Europe brought itself out of feudalism and into capitalism, with the first commodity being African people. This created the nuclear family that sustains capitalism. The entire concept of gender was created by and based on the premise of private property, which emerged from parasitic capitalism and the commodification of African human beings. Gender and sexual identities were constructed to reinforce capitalist notions of property ownership. What was known as the peasantry, people who were tied to the land they lived on and owned by the landlord, became the working class or middle class. Even gender and sexuality non-conforming Europeans could gain enough resources to be accepted in subcultural spaces, such as the arts and sciences, or create these spaces themselves. All of this was at the expense of Africa and African people. Every movement lead by white people has fought to make life better for that sector of the white population. It doesn’t fight to overturn the social system, but for that system to be more polite to that specific sector. Simultaneously we see the opportunism of white led movements repeating the colonial history of stealing material goods to unite for equal rights as the oppressor. In fact, it is the Black Power movement of the 1960s that spurred the movement for gay rights. It wasn’t until white people saw black people rising up against their own oppression that sectors of the white population began to fight for their rights. Stealing tactics, ideology and slogans─black power became gay power and black liberation became gay liberation. Yet the interests of working class African people were left behind and replaced with the interest of the white ruling class and petty bourgeoisie. Genuine liberation of LGBTQIA white people is not in the system but in overturning it under the leadership of colonized people. The African working class must lead because our relationship to African people is still parasitic, violent, and oppressive. As white queers, we steal African/black culture, language, dance forms, art and call it queer. Drag queens literally dress in black face and mock African women. We are the first to start the genocidal gentrification in African neighborhoods, making it comfortable for the rest of white society to colonize. We steal an anti-colonial battle against the police lead by an African trans woman, Marsha P. Johnson, and use it as a “gay rights” incident to enter into imperialist institutions of marriage, the U.S. military, the police force etc. The AIDS epidemic only became a national epidemic when it spread to the white gay population in the ‘80s. African women are of the highest growing population who are HIV positive, yet all the resources for access to prevention and health care surrounding HIV/AIDS remain geared towards white gay men and inaccessible to the black community. For the month of June, cities all over the country celebrate “Pride” by having imperialist corporate sponsored parades while hugging cops waving the rainbow flag. White LGBTQIA people march proudly, while Africans can’t walk down the street without the risk of police violence. White LGBTQIA people dance in gay clubs to music while African trans women are incarcerated and murdered. We celebrate while African people suffer at the hands of the State and the U.S. government. As a white person who subscribes to African Internationalism, I have no pride in the genocide my white LGBTQIA+ community perpetuates. We must overturn this relationship by getting under the leadership of the African working class and provide material solidarity through reparations. Solidarity with black power is the only way we will overturn this system. The Uhuru Solidarity Movement is where we stand united against all oppression and leave no one behind, as all white-led movements have done to African people. Join the Uhuru Solidarity Movement and pay reparations! It is our redemption, but also our liberator. It separates us from our allegiance to the white ruling class and aligns us with the liberated future of the African working class where no one is oppressed!